It’s fragrant, it’s beautiful and it’s delicious. You can grow it indoors in a container or outdoors in your garden. It’s easy to grow and doesn’t require much of your attention to maintain. 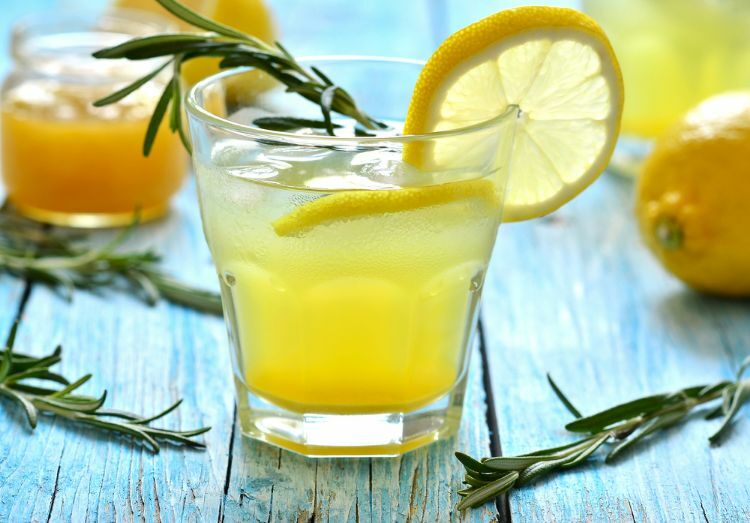 No wonder gardeners everywhere love rosemary, that woody perennial herb that can survive for years and bring all sorts of delights to the senses. Here are six tips for starting, caring for and harvesting this versatile evergreen shrub. Instead of planting seeds, find a mature plant and remove a 4-inch-long cutting. Strip off the leaves from the bottom inch or so of the cutting. (This is the part that will go into the soil). If you don’t remove the leaves before planting, the stem will rot rather than grow. 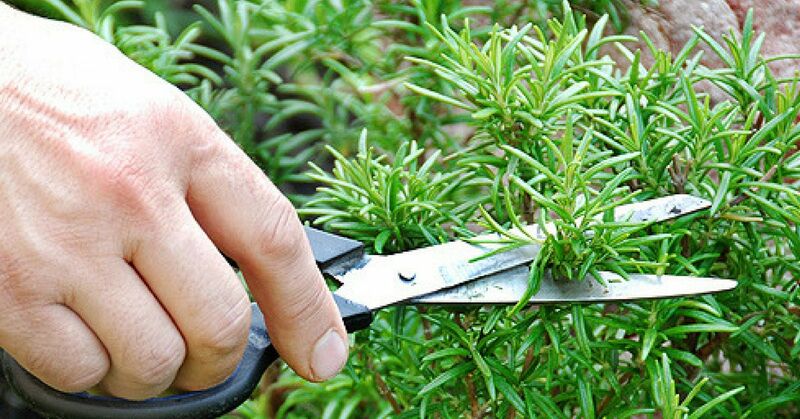 Dip the tips of the rosemary cuttings in rooting hormone (found in any garden center) to give them a head start. Plant the cuttings in a small pot filled with two-thirds coarse sand and one-third peat moss. The pot should be placed in a sunny location, although direct sunlight isn’t good for it. Water the cuttings regularly and keep them in a warm spot. Roots will form in about three weeks. As soon as roots have formed, plant the rosemary either in pots or outside in the garden. Rosemary will adapt to most growing conditions and is very hardy. It doesn’t mind snow or high temperatures, and it’s comfortable in almost any soil, as long as it drains reasonably well. Remember, rosemary can develop root rot in water-logged soil. You will need to decide whether you want to keep growing the herb in pots or as a shrub in the garden. If you live in a colder climate, you might be better off sticking to pots so you can move them inside during winter. 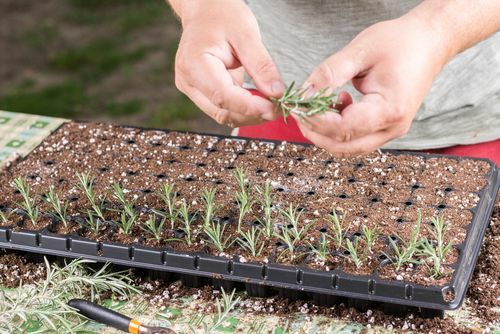 If you plan to keep the rosemary in the garden, pot it up first so it can establish more roots and get stronger before you plant it outside. Alkaline soil will help it be more fragrant. Some gardeners even use rosemary as a scented hedge. 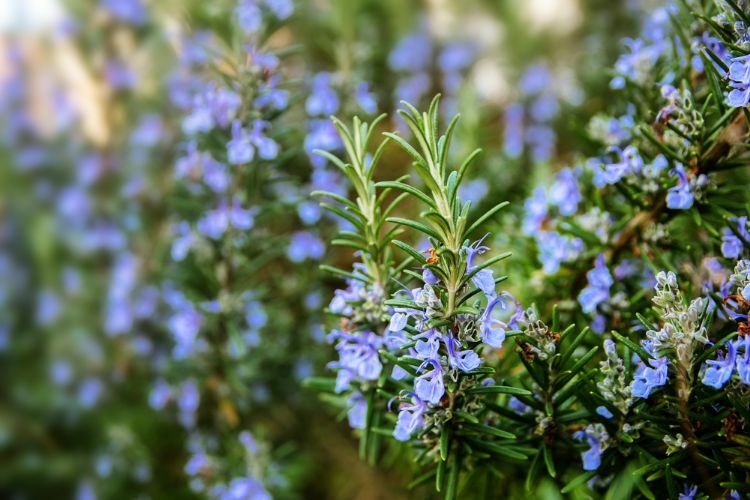 Although rosemary doesn't need frequent watering and practically never needs fertilizer, it is a good idea to trim branches back a few inches in the spring. Even though pruning isn't necessary for the plant's health, the bushes can get quite large and take up garden space. Pruning helps control their size and retain their shape. 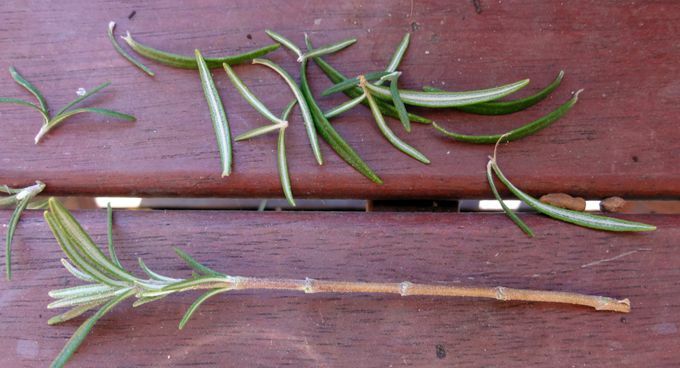 Pick sprigs of rosemary leaves whenever you need them. Because it’s an evergreen plant, you can harvest it all year. Store sprigs in a cool, dry place until you’re ready for them. Rosemary is an excellent complement to many dishes. In addition to its many health benefits as an essential oil, it can also be used in a simmer pot to fill the house with its amazing scent.